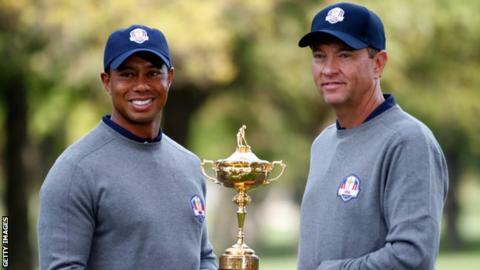 Tiger Woods has been named as one of United States captain Davis Love III's assistants for the 2016 Ryder Cup. Steve Stricker and Jim Furyk will also be joining Tom Lehman as vice-captains for the contest against Europe. Woods, 39, who is battling to recover from a persistent back injury, has played in seven Ryder Cups, the most recent in 2012 under Love's captaincy. "Once I'm fully healthy, I'd like to try to make the team too," said 14-time major winner Woods. "Either way, I'm very excited to work with Davis, the other vice-captains and the players to get a US victory." Should Woods, now ranked 384 in the world, qualify as a player, either automatically or via a captain's pick, Love has the option to name a replacement vice-captain. The US will be bidding to end a run of eight defeats by Europe in the last 10 editions of the biennial team competition when the 2016 Ryder Cup is held from 30 September to 2 October at Hazeltine National Golf Club in Minnesota. Love, who will name a fifth vice-captain at a later date, said: "These three guys, joining Tom Lehman, will send a message to our team that we are really serious about this Ryder Cup. "We are ahead of the game this time and it lets potential team members know that we are going to do whatever it takes to put them in the best position to win in 2016."